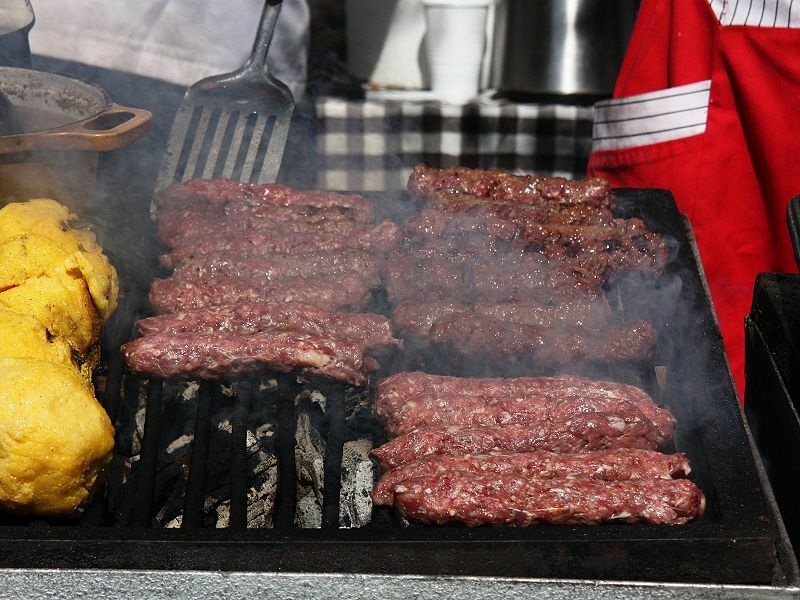 Mititei or mici (Romanian for little or small ones) is a traditional Romanian dish, grilled minced-meat rolls made from beef (usually mixed with mutton and pork), which contain garlic, black pepper, thyme, coriander, anise, savory and sometimes a touch of paprika. Sodium bicarbonate (and sometimes broth or water) is also added to the mixture. Left: Mititei on the grill. It is best served accompanied by mustard and beer. Ideally the mustard should not contain too much vinegar, because the sour taste does not fit with the Mititei. The mititei are very popular in Romania. Legend has it that mititei were invented one evening at an inn in Bucharest, well-known for its sausages, when the kitchen ran out of casings. Nowadays, it is very popular sold as fast-food or in restaurants close to traffic. They are also sold as processed food in supermarkets. NOTE: Keep a bowl of water handy to wet hands (this prevents the meat from sticking to fingers). Romanians eat mici with mustard inside a bread roll - add a cold beer and a lazy summer evening and you are in heaven.